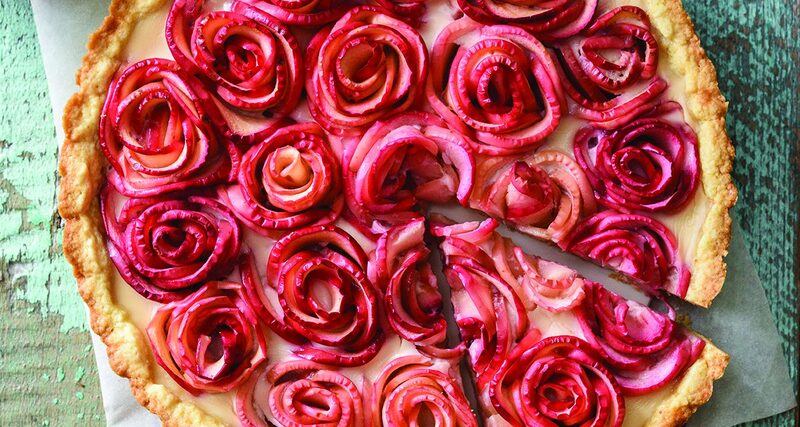 This beautiful tart is not only a stunning to look at, but even more delicious. Make it the centerpiece of your winter dessert table. For the Crust: In a food processor, fitted with the metal blade, process pecans with granulated sugar until finely ground, about 20 seconds. Add flour and salt; pulse to combine. Scatter butter over flour mixture and pulse 5 times. Beat yolk and vanilla in a small bowl and drizzle over dough. Pulse until dough clumps and just comes together, 5 to 8 times. Knead dough a few times, wrap in plastic and chill for 1 hour. Pre-heat oven to 325°F. Grease a 9-inch tart pan with removable bottom. Crumble chilled dough over bottom of pan and press evenly over base and up the sides. Freeze dough for 30 minutes. Place frozen shell on middle rack of oven and bake until golden brown, 30-35 minutes. Remove from oven, press any puffed up areas lightly with a spoon. Place tin on a wire rack and cool completely. For the Custard: In a medium saucepan combine milk, cream, ground cinnamon, salt, cinnamon sticks, scraped vanilla beans and pods. Heat to simmering, cover, and set aside to steep for 20 minutes. Once steeped, remove cinnamon sticks and vanilla bean pod. Heat again to barely simmering. Meanwhile, in a medium bowl whisk together the egg yolks, ½ cup granulated sugar, and cornstarch. Continuously whisking, very slowly pour the hot milk into yolk mixture. Once fully combined, return mixture to saucepan and cook over medium heat. Cook, stirring vigorously until mixture begins to thicken to a pudding-like consistency, and bubbles to break the surface. Immediately pour through a fine sieve and stir in butter. Cover with plastic wrap directly on surface of custard and chill. Assemble the Tart: Warm the apple slices in the microwave until pliable. Once you are done slicing, let the rolling begin. Place 8 slices of apple in a row with the ends overlapping and the peel all facing the same way. Gently roll up the apples into a rosebud shape. Pick up the bud and continue wrapping apple slices around rosette until desired size is achieved. For larger roses set the rolled apples on a board and continue to add overlapping slices. Place finished rose in a paper-lined muffin tin or small bowl to help keep their shape while the rest are rolled. Spoon cooled custard into baked shell and smooth surface. Place apple roses over the custard in a concentric pattern, around the first one, building a rose pattern. Use extra rolled apple slices to fill in gaps. Bake tart for 15 minutes. Cool tart on a wire rack.